Suma (Pfaffia Paniculata) referred to as Brazilian ginseng that may be helpful in combating anemia, fatigue, stress, as an immune booster, may be helpful in certain abnormal cell growths, liver diseases, high blood pressure, HIV and AIDS. Herbal Extract. Nature's Answer alcohol-free extracts are produced via our multi-extraction process using alcohol and water or other natural menstruums to ensure maximum activity. All alcohol is then removed using our proprietary process. Alcohol can stress a weakened or under-functioning liver in sensitive individuals, such as those suffering from allergies, environmental sensitivities, systemic candida, and/or a host of other health concerns. People in recovery from alcoholism cannot use alcohol. Alcohol is not appropriate for young children. Since alcohol easily evaporates, it can lose its effectiveness as a preservative for the herbal constituents as the amount of the alcohol in the bottle decreases. Nature’s Answer's alcohol-free extract formulas replace alcohol with natural vegetable glycerin. The Bio-Chelated method incorporates soaking for a period of time, using different menstruum ratios for different plants to optimize their therapeutic values. Furthermore, this procedure offers additional significant advantages when compared with other types of extraction processes commonly employed by competitors in the herbal industry. In addition, the Bio-Chelated process incorporates the use of an exclusive technique that removes much of the alcohol used during the menstruum soaking (maceration) phase, replacing it with vegetable glycerin instead. The resulting yield is an herbal extract that is either alcohol-free, or has a low alcohol content. Both alcohol-free and low alcohol products from Nature's Answer feature vegetable glycerin only. The Bio-Chelated method was the first extraction process to yield a 12-14% alcohol extract in the herbal industry! Glycerin helps to bind certain plant constituents and is easily absorbed by the cells. Glycerin occurs naturally throughout the body. It also makes up a portion of the cellular membranes. This gives glycerin an affinity for the body, making it an excellent carrier for herbs. Glycerin serves to protect and preserve the potency of the herbal extract in the bottle over the life of the product longer than alcohol would. Glycerin, due to its viscosity (thickness) aids in maintaining the freshness and potency of the herb for the life of the product. Glycerin has the added advantage of acting as a sugar-free natural sweetener, thus making the taste of some bitter herbs more palatable. Shake Well. As a dietary supplement 1-2 mL. (approx. 28-56 drops), 2-3 times a day. Keep out of reach of children. 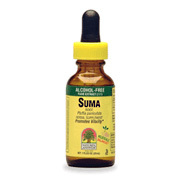 Holistically Balanced Fluid Extract (1:1) of Suma Root. Suma Root (pfaffia paniculata). Coconut Glycerin and Triple Filtered Water. What are the most popular herbs in the market today, and what are they used for? Echinacea - Stimulates the immune system. Ginkgo - Enhances cerebral circulation and increases mental functioning. Thistle - Strengthens and detoxifies the liver. Goldenseal - Stimulates the immune system, and is particularly effective for conditions involving mucous membranes. Astragalus - Serves as a tonic for the immune system (ie. builds and strengthens). St. John’s Wort - Acts as an antidepressant and as a potent immune enhancer. What is the difference between a fluid extract and a tincture? A fluid extract is an extract with an herb to menstruum ratio of (1:1). This means that you get 1 gram of herb for 1 ml of extract. A tincture is an extract with an herb to menstruum ratio of (1:2), (1:4), (1:5) or (1:10). This means that to get the same 1 gram of herb you must take either 2, 4, 5, or 10 milliliters of extract (respectively). How do you know what a milliliter is? Usually a milliliter is approximately 28 drops of an extract, but since this is a commonly asked question, Natures Answer has answered this question by using calibrated droppers that show exactly how much extract you are taking. Which is a better form of taking herbs, liquid or capsules? Herbs can be used in both the liquid and capsule form depending on your personal preference. Liquids are more easily absorbed and are perfect for people who have trouble swallowing pills, such as children and the elderly. Unlike other liquid brands, Nature's Answer is alcohol free or very low in alcohol (12-14%). Capsules may be preferable because using them avoids the bitter and unpleasant taste of some herbs, and they can be packed in a pill case for ease of dosing, convenient for the supplement user on the go. Why do extracts have alcohol in them? In order to extract plant constituents most effectively, it is necessary to use alcohol. Alcohol is used because (a) it is the strongest solvent we know of that can extract a major portion of the plant constituents without harming its properties and (b) it is ingestible. (As a point of interest, Nature’s Answer uses only certified organic alcohol in their extracts). What is the benefit of using an alcohol-free extract? Firstly, many people simply do not like to use alcohol as they strive towards healthier living. Others may not use alcohol for religious reasons, because they are in recovery or are pregnant or nursing. Furthermore, alcohol is not for children. These products address all those concerns. Secondly, and most importantly, alcohol-free extracts allow you to taste the plant, not the alcohol! This taste is extremely important in that it gets your body ready to receive the gifts that the plant has to offer. Tasting the herb is part of the overall herbal experience and healing process. Alcohol-free extracts enable you to truly appreciate all of the plant's gifts. If alcohol is needed in extraction, how do you make an alcohol- free extract? Nature’s Answer begins with organic alcohol regardless of whether the final product contains alcohol or not. After finishing the first step in the plant extraction, we perform an additional step to remove the alcohol. This is done by utilizing a proprietary cold extraction process called Bio-Chelation. Bio-Chelation describes the cold process vacuum distillation method, which removes all the alcohol initially used to obtain the good herbal extract. It is important to note that a cold extraction process, as opposed to a heat extraction process, helps maintain the full spectrum, or Holistic BalanceT of the plant's constituents in the final product. The end-result is an alcohol-free extract containing the essential properties of the complete herb in a base of vegetable glycerin and water. (Vegetable glycerin is used because it can help to bind certain plant constituents, is natural to the body, easily absorbed, tastes sweet without affecting blood sugar levels, and acts as a good solvent and carrier for the plant constituents). This is a good question. Nature’s Answer uses three types of herbs in their formulations…Certified Organic, Responsibly Wildcrafted, or Cultivated. Our certified organic herbs come from a variety of organic farms located throughout the United States. Many of our formulas also feature Responsibly Wildcrafted herbs. Responsibly wildcrafted herbs are those picked in a responsible manner, whereby no plant will be over picked and therefore, be a risk to the existence of the species. They are picked in their natural environment at optimal times for harvesting, and have not been exposed to any sprays or fertilizers. These plants are also considered organic; however since they are not “certified”, they are referred to as wildcrafted herbs. Cultivated plants are grown without the use of chemicals or pesticides but are not certified organic and therefore, cannot be called organic. Ultimately, no matter the source of our herbs, all are fully tested for microbes, chemicals and residues … contaminents that could compromise the quality of the herb. Is it safe to take herbs with my medications? Most times it is safe to take herbal supplements from high-quality, reputable manufacturers along with doctor prescribed medications. It is important, however, to know that many herbs will enhance or facilitate the actions of the medications you are taking, so you should leave a few hours between taking an herb and a medicine. While most herbs don't react negatively to medicines, it is of utmost importance to first check with your healthcare practitioner before beginning any nutritional supplement program, and ALWAYS tell your practitioner if you are taking anything in addition to what they have prescribed. Can I take all my herbs at the same time? This is a tough question to answer, as it depends on the types of herbs you are taking, the reasons you are taking them and your overall body. It is okay to take tonic herbs together, meaning those gentle herbs that have a strengthening action to the body. If you are using herbs for acute conditions, it is best to take them separately from your other herbs. I catch every cold that comes around my office; what can I take to keep me healthier? The best approach to take is to use tonic herbs that will build your immune system, rather than relying on Echinacea every time you get a cold. The best herbs to take to strengthen and support the immune system are Astragalus, Reishi (or any of the medicinal mushrooms like Maitake or Shiitake) or any of the Ginseng herbs, to name a few. These herbs are ideal for overall natural protection. Suma Alcohol Free Extract is shipped in a discrete, unmarked package. Orders are processed immediately and usually take about 3 to 5 working days to be received. We do ask that you try it for 2 to 3 weeks to feel the full effects. Any information received is used only for order processing and shipping purposes. Your information, such as e-mail address, will never be disclosed to a third party.